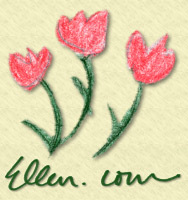 Ellen.com has been created from my heart as a tribute to celebrating life, embracing change, taking risk and experiencing peace and joy. My wish is that all who have journeyed here find hope in shared experiences, courage to explore self-care and a willingness to open yourself to give and receive love. I am frequently reminded that life is about the quality of our journey and not our destination. The thoughts, ideas and dreams shared are mine from the pain and sorrow to the peace and joy. Join me in exploring our innermost selves and exposing our deepest, darkest secrets. Secrets, even good secrets, create negative energy and put a strain on our body, mind and soul. A secret is purposefully keeping knowledge from others, keeping one’s affairs to oneself, being secluded, mysterious. A secret deeply buried within for a prolonged period of time becomes denial. Denial left festered can cause unlimited physical, emotional and spiritual wounds. Revealing, surrendering and healing from a secret liberates the soul, renews the spirit, fosters forgiveness and promotes love. Freedom from the darkness of guilt and shame allows the possibility of grace to reach all aspects of our life. I invite you to journey with me.